The Graduated Full Persian Necklace is a stunning beauty. It is constructed of nine different ring sizes that are smoothly transitioned throughout the necklace. The necklace kit is for 18 inches but you can purchase additional two inch kits for a longer length. The necklace also comes in a large or a small size. The size refers to the largest section of the necklace which is the middle that hangs the lowest around your neck. 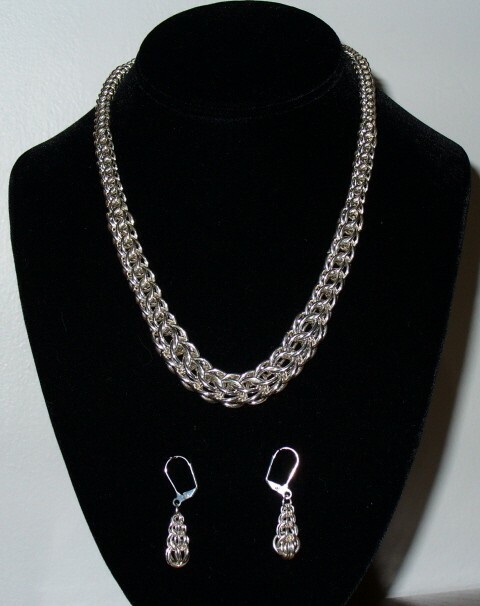 The large necklace has 14 gauge rings while the small necklace has 16 gauge rings in the center. You can also select a single ring color, or make a two tone striped (available upon request). The choice is yours. This is an intermediate weave. A sterling silver or yellow gold filled balloon clasp is included in the kit.